Market requirements call for weight reduction to increase fuel efficiency and lower green house gas emissions. High strength to weight materials that are resistant to industry chemicals, offer temperature and wear resistance, and can be efficiently manufactured are part of the Advanced Engineered and General Engineered material portfolio that Mitsubishi Chemical Advanced Materials offers to this market. Our technical service and development teams can help provide guidance on material selection from our broad product portfolio to ensure the best and most cost effictive solution is chosen for your application. Mitsubishi Chemical Advanced Materials’ global approach to the industry supports our customers throughout the world. We provide full material seminars and application assistance to prime contractors, tier 1 and tier 2 suppliers. We offer a total solution approach by supplying either semi-finished stock shapes, near net molded shapes, or a finished part through one of our Technical Centers or Fabrication Partners. Our global stocking warehouses and distribution networks help insure your product is available when you need it most. The products of Mitsubishi Chemical Advanced Materials are found in all types of aircraft: fixed wing / rotor craft; commercial / military; corporate / private; manned / un-manned. The applications vary from wear surfaces on components, specialized bushings in closures, to seals in hydraulic systems. Each major system within the aircraft can benefit from the enhanced properties of Mitsubishi Chemical Advanced Materials' products. Typically the highest temperature portion of the aircraft, the external surface of the engine can exceed 350°C. By pass air cools the surface during flight however hot gasses can be present during thrust reversal upon landing. Mitsubishi Chemical Advanced Materials offers a high temperature portfolio of materials to meet the needs of Engineers and designers of components within this area. Whether the main or nose landing gear, this major system within the aircraft is subject the most vibration due to turbulent airflow. While normal operating temperatures range for -40 °C to 70 °C, the temperature near the brakes can exceed 650 °C. Mitsubishi Chemical Advanced Materials offers a wide range of materials that are light weight, withstand high temperature variation, are self lubricating, and are vibration, chemical, and wear resistant. The wing assembly controls the lift and roll of the aircraft. Hydraulic actuators control flaps and ailerons on the wing as well as the rudder on the vertical stabilizer and elevator on the horizontal stabilizer. The products of Mitsubishi Chemical Advanced Materials are used as wear plates on the control surfaces and seals within the actuators and de-icing ducts. The fuel tanks are also located within the wing. Mitsubishi Chemical Advanced Materials offers products that are resistant to aircraft fuels and can be used in valves and pumps. We also offer materials that have anti-static properties where needed. 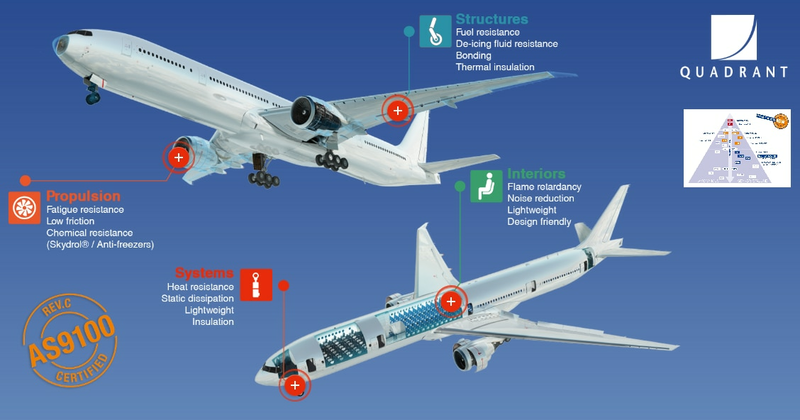 Everything within the fuselage of an aircraft is considered part of the interior. It may be the HVAC system, the fresh / waste water system, the cargo system, or the bins, seats, service carts and bulkheads that make up the cabin. Mitsubishi Chemical Advanced Materials offers advanced materials that enable weight reduction, are chemically resistant, and meet the stringent flammability, smoke, and toxicity requirements of today’s aircraft interiors. The products of Mitsubishi Chemical Advanced Materials are found in missiles and rockets, satellites that orbit our earth, as well as manned and unmanned space vehicles that explore the outer regions of our solar system. The applications vary from bushings, wear plates, and support structures to insulators and thermal isolators. Materials in these vehicles must possess cryogenic compatibility and have low out-gassing characteristics. 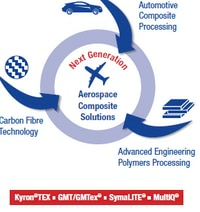 Mitsubishi Chemical Advanced Materials offers products that have these qualities.